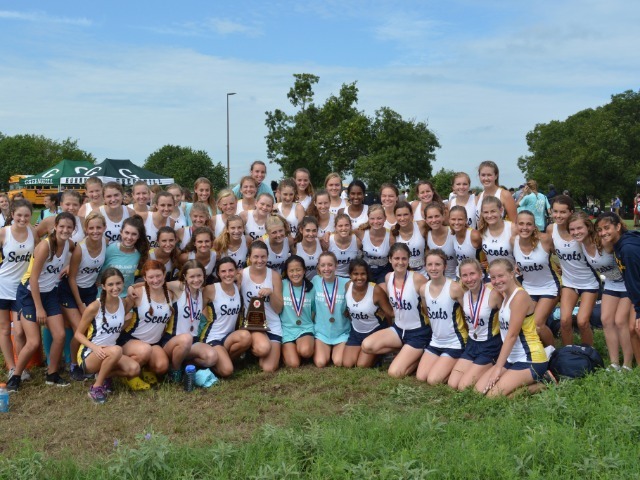 The Lady Scots Cross Country Team competed at the Northwest Ken Garland Invitational on Saturday, September 15th. The meet was held at Discovery Park in McKinney. In the Varsity Division, the Lady Scots placed 1st with 36 points - there were 13 teams and 105 runners in this division. The team was led by sophomore Sophia Oliai. She placed 3rd with a time of 18:40.4 (a season best). Cameron Fawcett, who is also a sophomore, placed 7th with a time of 19:14. Senior captain Maddy Stephens placed 9th with a time of 19:41.1 (a season best), and freshman Alli Grace Ott placed 10th with a time of 19:43.9 (a new personal record). The other team members were sophomore Isabel Blaylock (20:05.1 – a new personal record), juniors Gracyn Applegate (20:08.2 – a new season best), Grace O’Keefe (20:41.7), and Phoebe Spackman (20:55.5 – a new personal record), sophomore Elle Thompson (21:14.1 – a season best), and junior Annemarie Whalen (21:22.8 – a season best). In the JV Division, the team placed 1st with 30 points. There were 10 teams and 130 runners in this division. The team was led by sophomores Sydney Denison and Hollis Vaughan. Denison placed 3rd with a time of 21:34.4 (a season best), and Vaughan placed 4th with a time of 21:54 (a season best). Freshman Sterling Willis placed 6th (22:10.9 – a new personal record), senior captain Ashley Booe placed 8th (22:20.6), and senior Maddy Brown placed 9th (22:21.9). The other top two runners for the JV were freshman Lily Baumgartner and junior Breanne Spence. The team set 22 new personal records (some are listed above): Adelaide Aiken, Hadley Bornemann, McKay Parker, Scarlett Randall, Lola Rodriguez, Avery Turner, Morgan Stalker, Paityn Soucy, Katelyn Turco, Ava Haberer, Caroline Dugan, Bethany Spence, Ellie Jones, Dharma Kikkeri, Brennan Jordan, Lynne Bush, and Isabella Reynolds. The team also set 44 new season bests. The next meet for the Lady Scots will be the Lovejoy Cross Country Fall Festival on Saturday, September 22nd. The meet will be held at Myers Park in McKinney. The first race begins at 7:30 a.m.